The historic enclave of Santo Domingo, known as the Colonial City, covers only one square mile (3 sq km), but inside the walls are dozens of historical buildings and sites, including palaces, forts, museums, and churches; parks, plazas, statues and monuments. A walking tour of these fascinating buildings takes at least three hours through cobbled streets, where once walked Christopher Columbus, Fernando Cortez and Francis Drake. 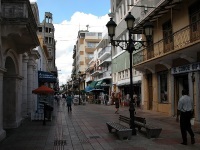 The main street, Calle de Las Damas, is the oldest street in the New World. Must-sees include the House of Cord, the oldest European building in the Americas, and where Diego Columbus, son of Christopher, once lived; and the Alcazar Palace, now a museum, built between 1510 and 1514.